Trac-hoes, 100 Ton Cranes, and VERY Large Boulders. I have just put up what I am going to call a “project page” on my website. It concerns this sculptural piece that I named Ascension It is on a hillside going into a large city in South Carolina, and I had hoped it would look like whitewater tumbling off the hillside. 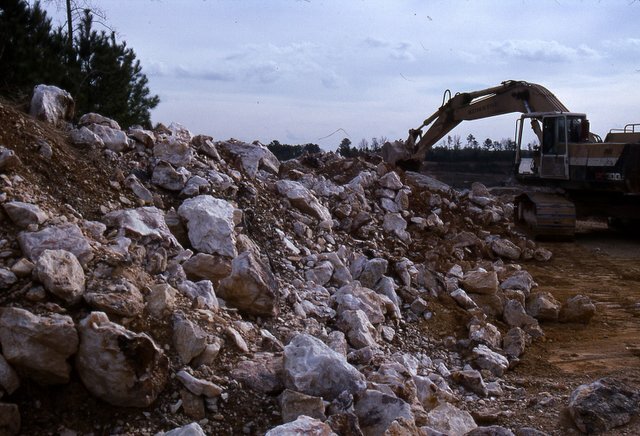 In the above photo you are looking at the quarry where the stone came from. A mica-schist for the outcroppings, big boulders, banks, etc. and a quartzite to represent the whitewater (lots of mineral deposits and flakes to make it shine –especially at night with lights). Right now I just have a lot of images up and am going to add a narrative in a day or two. Two things will always stand out from this project for me. One—it took 3 times as long to prep as it did to execute the installation of the project. Two— it was a lot of fun, a lot of fun. I’d do it again, given the opportunity. The above shot is the crane in action. We spent 2 full days just preparing the correct base for the crane and it’s outriggers to stabilize on. It’s good to be careful when moving boulders weighing as much as 13/14 ton. 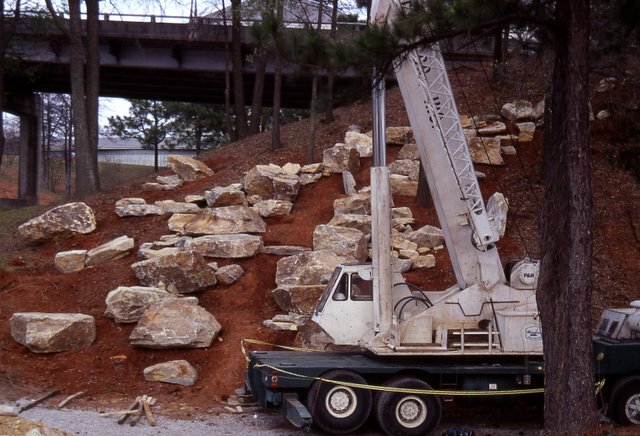 Placing boulders-this one probably weighs in under 2 and a half ton — a mere lightweight. So safety at all times – which is really about being alert. 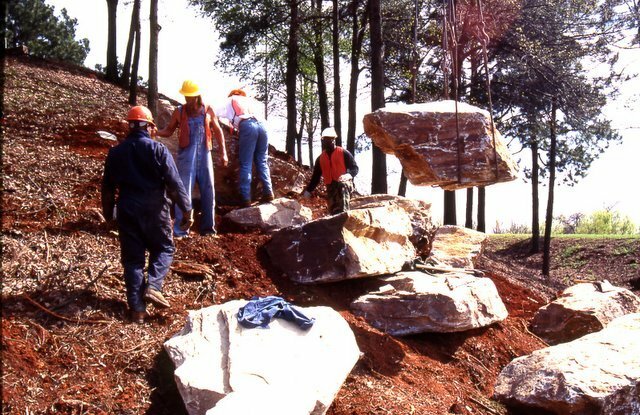 While those guys are doing the final prep, the crane operator and I did a strange dance to communicate where and how I wanted the boulders placed. The other nice thing about this was that it was not a pedestrian area so I had some latitude in placement. After all, my primary viewer was going by in cars at 40-55 mph making detail in placement a non-issue. The city did a little bit of planting around the edges to soften the area, I would have liked to put in several hundred grasses but there was no budget for that sort of planting. Final thoughts, it was a great challenge – especially logistically, but it was a lot of fun. I hope it brings a little bit of enjoyment to those that drive by everyday. Next PostNext Landscape Design Principles, Time.